With a project as complex as the construction of the ITER machine and plant it is easy to lose sight of the big picture over the many intricate details. Angie Jones from the MOMENTUM consortium makes sure that this doesn't happen. She fiercely defends the need to look at the construction project with the eye of an eagle. Angie Jones (right) regularly meets with colleages on the worksite to see progress and problems firsthand. Here, she gets briefed by her health and safety manager, Leanne Dargacz. The MOMENTUM Joint Venture joined ITER's quest for fusion energy in the summer of 2016 as Construction Manager-as-Agent (CMA). 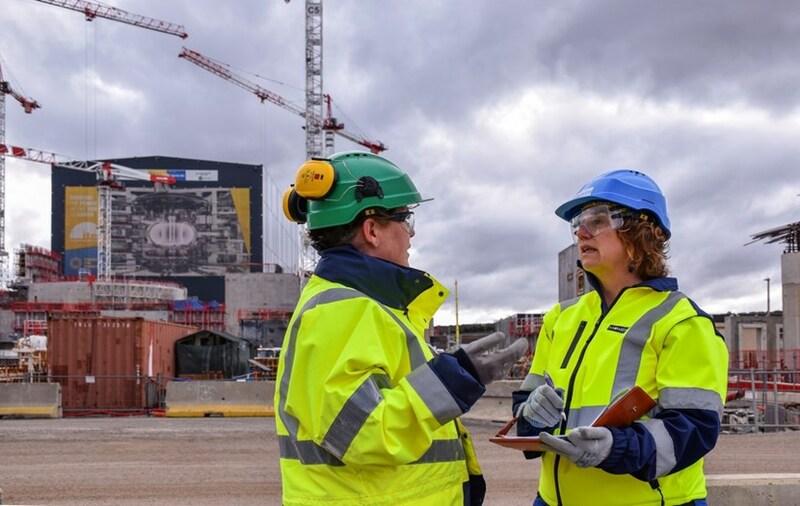 Its main task, according to Project Director Angie Jones, is to bring all the strands together and make sure that the ITER machine and plant are assembled and installed on time, safely and in compliance with budget. "Our mission is to manage, coordinate, and supervise assembly and installation activities on behalf of the ITER Organization. As CMA, we share industry best practice for large construction projects, and adapt it for implementation at ITER." MOMENTUM is led by Wood (UK, formerly Amec Foster Wheeler) in partnership with Assystem (France) and KEPCO Engineering and Construction (Korea). Based on already completed scientific and engineering work, MOMENTUM puts together controllable construction work packages for the contractors, who in turn break them down into installation work packages. "These detailed packages allow us to monitor and measure the work as the construction manager," says Jones. Jones and her 70 colleagues are fully focused on their mission as ITER's construction management partner. They deliver processes and procedures for all phases: construction preparation, project management, contract management, interface management, site coordination, construction supervision and completion. The biggest part of her job is integration—bringing all the elements together and identifying gaps. This means raising the focus from specific engineering and manufacturing tasks to the long-term goal--achieving First Plasma in 2025. It all comes down to perspective, according to Jones. "Chickens keep pecking on the ground, never looking up to see what's going on elsewhere. But the eagle can see everything from a great height," says Jones. "We must shift to a project delivery culture in which construction needs drive the engineering and procurement priorities. Angie Jones is used to taking on large and demanding engineering projects, often in far-flung or testing locations. "Challenge motivates me," she says. An engineer by background, she started her career at the Oak Ridge National Laboratory in the US, dealing with the remediation of nuclear waste and the decommissioning of obsolete nuclear research reactors. She later managed the demolition of several obsolete space launch complexes at the US Cape Canaveral Air Force Station in Florida. Her job as a contractor for the US government brought Jones to work in many different countries. Just before starting on site at ITER, she was contracted by the US Air Force Space Command to build a radar station and power plant on the Kwajalein Atoll, Marshall Islands, to create a space surveillance system to protect satellites against space debris. She calls it the "right-to-left approach," where the end goal—completing the installation—defines the construction project schedule in all its phases. Jones named her high-level strategy meeting with the MOMENTUM leadership team the "eagle meeting." This is where the team works together to identify transversal challenges and to bring solutions to the ITER Organization. As might be expected, it took some time for the CMA partner to find its place among pre-existing ways of working. The political nature of ITER was also a new challenge for Jones—requiring the team to go beyond industrial construction expertise and be diplomats as well. And in front of engineers, scientists and project administrators who, for some, had already spent a decade on this project, it was necessary for the MOMENTUM team to persuade others that it shared the same commitment to making ITER a reality. "Today, I feel more of a partner than ever before," she says. Jones has begun to see the fruit of her persistent efforts. The MOMENTUM delivery organization has evolved along with the ITER Organization to prepare for the phase ahead, and it is now fully aligned with clear lines of authority for quick decision making to deliver on the construction objectives. "It's been worth it to work so hard for these synergies over the last 17 months," she concludes.